Raminus Polus, an Imperial sorcerer, is a Master-Wizard of the Mages Guild who sells spells at the Arcane University in the Imperial City. If you complete the mages guild questline, you and Raminus become the only members of the Council of Mages. He assigns you the majority of the quests in the guild's questline and will also promote you as you advance through it—with the exception of Arch-Mage, which he will rather acknowledge than present you with. When you have completed all of Recommendation quests, he will grant you access to the Arcane University. If you ask around for a cure to vampirism, you will be directed to him. During the Thieves Guild questline, when Hrormir's Icestaff goes missing due to reduced guard activity, he will send a Dremora messenger to Hieronymus Lex to demand that they be reinstated. If you ask any Imperial battlemage about his location they will respond: "Looking for Raminus, are you? Well, you'll find him in the lobby of the Arch-Mage's Tower, in the center of the University." Indeed, he lives a very relaxed life in the University, as most high-ranking Mages Guild members do. At 8am he leaves the Mages' Quarters and heads for the Arch-Mage's Lobby, where he will be found for most of the day. When he arrives, he immediately sits down for a two-hour breakfast. From 10am until 6pm he will be found pacing restlessly around the Lobby, breaking off at midday for a three-hour reading time. After eating a two-hour dinner while sitting on one of the benches, he leaves the Lobby for some fresh air and an evening walk around the University campus. At 10pm he will return to the Lobby, where he will spend the next three hours wandering around sleepily, before heading to bed at 1am. He wears the standard mage's robe and a pair of gold trimmed shoes. He also carries a copy of the standard text Manual of Spellcraft and a sizable amount of gold. He doesn't wield any weapons, relying instead on a set of high-level spells from all of the magical schools. These are also the same spells that you can buy cheaply off him, since his Mercantile is a mere 18. He will offer his services when not eating or sleeping. A Mage's Staff: Complete your induction into the Mages Guild by creating your own staff. Vahtacen's Secret: Find out how the Mages Guild's excavation of Vahtacen is faring. Necromancer's Moon: Find out about Black Soul Gems. Alchemy Acquisitions: Use the expertise of Julienne Fanis for your own benefit. Join the Mages Guild: Join the Mages Guild and earn recommendations from all guild leaders to gain access to the Arcane University. Confront the King: Find the King of Worms and end the Necromancers' attacks on the Mages Guild. Mages Guild Suspension: Collect alchemy samples to regain your guild membership. When meeting Raminus for the first time he will welcome you to the Arcane University. When asked about the mages guild he will instruct: "If you wish to become a part of the Mages Guild, seek out the heads of the local guild halls. They will instruct you further." After you have obtained at least one recommendation he will comment: "You haven't yet been given recommendations from the necessary individuals, Associate. Keep working at it." "Time for you to see where the real power of the guild lies. Raminus Polus will want to speak with you; head to the Arcane University." "You've been to all the guild halls, haven't you? Well, then you're all set! Congratulations! You'll need to speak to Raminus Polus at the Arcane University now. Look at you, moving up in the world... how wonderful!" "You have received recommendations from every guild hall, have you not? Then you are ready to advance to the Arcane University. Raminus Polus will want to speak with you. I must say, you will be a credit to the guild. Arch-Mage Traven will be lucky to have you there." "All of your recommendations have been approved, have they not? Then everything appears to be in order. Report to the Arcane University, and speak with Raminus Polus. He will provide further instructions for you." "You've been through quite a bit, haven't you? Well, I think you have proven yourself worthy. The Arcane University awaits you now. Speak with Raminus Polus when you arrive. He will assist you." "Your time has come. The Arcane University needs you, child. Raminus Polus waits for you even now. Great things will befall you. There will be trials, but you will prevail. You must, for the good of the guild." "You have all the recommendations you need, I believe. Raminus Polus will want to speak with you. You can find him at the Arcane University." Upon arriving at the University he will give you a warm welcome: "Hello, Associate. It seems you've obtained the final recommendation you required." He will continue: "I have received recommendations from all the local guild halls in Cyrodiil. You have done very well for yourself. You may now enter the University. As a full-fledged member of the Mage's Guild, I now also promote you to the rank of Apprentice, and grant you the Robe of the Apprentice. Take a moment to try it on, and then we shall speak of what comes next for you." When you approach him afterwards he will reflect on the state of the guild itself: "We come to the real work at last. You have, no doubt, seen some of the worst the guild has to offer. As much as we try to hold mages to a higher standard, they are only human. What I hope you will now see is that while the guild can be disjointed and misused, it can also achieve some wonderful things. Now you have an opportunity to engage in more meaningful tasks, and continue with your advancement through the guild." On the subject of the guild itself he will give you a bit of insight on the Arcane University: "The Arcane University has been here for nearly as long as the Mages Guild has been in Cyrodiil. It has been our home for ages." If ever you ask for advancement before completing the appropriate task he will reply: "You do not yet qualify for further advancement in the guild." When you are ready to begin your first task he will inform you: "Before you can begin work for the guild, you'll need to do something for yourself. Every mage carries a staff. It is crafted and enchanted by the guild, and is a symbol of status. You need such a staff." When you proceed to discuss the staff he will instruct: "The wood used for staves comes from a grove to the northeast of the Imperial City, near Wellspring Cave. Several mages tend to the grove, and should be able to assist you. Speak with either Zahrasha or Elette [sic] when you arrive. And choose wisely." If you need more information he will add: "Wellspring Cave lies to the northeast of the Imperial City. The mages there can assist you." He will also repeat the task: "You have your task. Acquire wood for a staff from the grove outside Wellspring Cave." When you have finished conversing with him he will say: "You shall have a true Mage's Staff soon." If you reenter conversation he will be surprised: "You should be out acquiring a Mage's Staff for yourself. What do you need?" Once you have returned from Wellspring Cave he will be astonished: "What? Necromancers at the cave?" On the subject of necromancers he will express his disbelief: "Eletta and Zahrasha dead? I can't believe it! They've never been so bold before now. Always hiding in the shadow, staying away from the guild. What could have prompted this? I'll need to speak to the council about this. Thank you for relaying the information. Now tend to your staff, and your wounds, if necessary. Delmar at the Chironasium can help you with the staff. See him right away." If further asked about the staff he will repeat: "Now that you have the wood, speak with Delmar at the Chironasium." Until you finish your staff he will always say: "You have your task. Find Delmar, and ask for his help." Once you have claimed your staff he will be ready to give you your next assignment: "I have a new task for you." If ever you attempt to start your new task without first being promoted he will inform you: "Before we begin, we must first discuss your advancement within the guild." When you speak of advancement he will be delighted to tell you: "In accordance with guild rules, you now qualify for the rank of Journeyman. May you wear your rank well." He will then explain your next task, entitled Ulterior Motives: "The Council is investigating what happened at Wellspring Cave. Many of our resources are devoted to the task, leaving our ranks spread thin. There is a related book that needs to be recovered. It was recently loaned to Janus Hassildor, the Count of Skingrad. I'd like you to retrieve it. I understand this may not seem the most important of tasks, but still... it needs doing, and you are one of the few available to do it. A note of caution: Skingrad is an... unusual place. Be prepared for the unexpected." On the topic of the Count he will describe him: "The Count is a reclusive man, and sometimes difficult to see. Hopefully, your status as a representative of the Guild will aid you. Speak with the castle steward when you arrive." 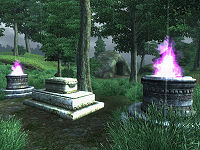 When asked about Skingrad he will describe its location to you: "The city lies southwest of the Imperial City. The castle overlooks the city from a steep hill. You should have no trouble finding it." If spoken to again, Raminus will expect it to be taken seriously: "You have your task. Perform it as well as you would any other." Once you have spied on Hassildor he will ask you: "Have you been to Skingrad, and seen Count Hassildor?" When you fill him in on the events he will be surprised: "Saved you, did he? Well, that's a good sign. I must apologize. It was never the Council's intention to put you in harm's way." He will tell you why he lied to you: "The Count's unique nature is not public knowledge. The Council wishes to keep it that way. At the time, it was believed there was no reason to inform you, since it was not crucial to the task you were given. For that reason, I was unable to disclose more about his true identity to you. Clearly that judgment was in error. I apologize." He will continue, to inform you why you were sent: "Arch-Mage Traven feared that sending a high-ranking official with the guild might draw too much attention, and provoke a reaction from the Count. We were also concerned that it might drive any necromancers in the area underground, making them difficult to root out." He will explain further: "We simply wanted to survey the situation in Skingrad. Our relationship with Hassildor is tenuous at best. The Council has agreed to keep his nature a secret, and in exchange he occasionally provides us with useful information." He will then expose the Count's true nature: "As a vampire, the Count has few allies he can trust. He has disguised his nature from most, but cannot hide it from the Council of Mages. So, he approached us with an accord. As you have seen, that agreement is under a great deal of strain lately. The Count does not agree with certain policies the guild has established." He will assure you of the guild's intentions to protect a vampire: "It's not quite that simple. Hassildor is powerful, to be sure, but the Council does not consider him a threat. After all, he has ruled over Skingrad for quite sometime without incident." Raminus will admit their lack of trust in the Count: "We feared Hassildor may have been involved with the Necromancers. Thanks to your involvement, it would seem that he is not. At least, not for the moment. We will continue to monitor the situation, but I assure you we will make no further attempts to mislead you. You have done your job admirably, and I thank you for it." When you are ready, speaking with Raminus will give you your next assignment: "I have a new task for you, and I assure you there are no Necromancers involved." You will be eligible for advancement: "Your services to the guild have not gone unnoticed. As of this moment, you have gained the rank of Evoker. Along with your new rank, please take this amulet. May it help keep you safe in times of danger." He will then proceed to give you the Spelldrinker Amulet. To receive your next mission speak with him further: "Are you ready for it? If not, I understand. You've been through quite a bit lately." If you need more time he will be understanding: "As I said. I fully understand. I shall be here when you feel you are prepared." If instead you insist you are ready he will instruct you further: "Very well. There's a research project going on at one of the Ayleid ruin sites on the eastern side of the province. Irlav Jarol is in charge of the project and is apparently in need of some help. I thought you might need a break, after the things you've been exposed to lately. You can find Irlav in the Arch Mage's Tower." Raminus will tell you more about Irlav if you're interested: "He's a good man, but Council matters have distracted him lately, and he's been neglecting his other work." He will point you towards Irlav for more information on your task: "Speak with Irlav Jarol. He can give you the details you need." When exiting dialogue he will remind you: "Irlav should be waiting for you." When speaking to Raminus he will again remind you of your task: "You should be helping Irlav Jarol, shouldn't you?" You will then have to seek out Irlav Jarol to learn about the Vahtacen's secret. After receiving your task from Irlav, Raminus will wish you luck: "Good luck with Irlav's project." Once you have delivered the Ancient Elven Helm to Irlav, Raminus will express his gratitude: "Good work at Vahtacen. Jarol is quite pleased with the information now coming in about the site. There is another predicament which I believe you can also help resolve, if you feel ready for it." If you are not ready he will be patient: "I shall be here when you are ready." You are now eligible for advancement and Raminus will inform you of your importance: "You become more valuable to the guild with each passing day. The guild wishes to reward that, and so you are raised to the rank of Conjurer. Accept these robes, and wear them with pride." He will proceed to give you the Robe of the Conjurer. When you return to him for your task he will ask you "Are you prepared to begin your next task for the guild?" When you are ready to begin the task he will inform you: "Excellent. You have become most reliable, and I assure you that the Council appreciates it. Now, to the matter at hand. In order to deal with the apparent growing problem of Necromancers in Cyrodiil, the Council needs as much information as possible. The Mystic Archives have been consulted with minimal success. Guild members are investigating other avenues, but I believe more can be learned here." He will proceed to say: "What little we know makes no sense in a larger context. For example, why was Falcar -- who we know now to be part of this cult of Necromancers -- in possession of Black Soul Gems? The Arch-Mage has other reports of these gems being associated with Necromancers, but we do not know why. We don't even know what they do. We have overlooked these questions because we are so focused on rooting out the Necromancers as quickly as possible." He will continue, instructing you on how you can help: "I'd like you to speak with Tar-Meena at the Mystic Archives. She is our specialist on magicka arcana, and has been helping gather information. I believe we have been asking her the wrong questions, taxing her too much with vague attempts to make sense of all that we know. Speak with her specifically about these Black Soul Gems. If she knows anything about their powers or creation. An insight to their origins may lead us to those who are responsible for them." He will describe Tar-Meena: "Her expertise in arcane knowledge and lore could be invaluable to us, if we can make proper use of it. She can likely be found in the Archives now, poring through materials on Necromancy. She stops only to sleep, at the Arch-Mage's request." Upon ending conversation he will ask you to make haste: "Report back as soon as you can." If you engage in further conversation he will ask: "Has Tar-Meena been of use gathering information about the Necromancers?" Once you have retrieved the book Necromancer's Moon from The Mystic Archives, he will praise you for your efforts: "Excellent work. I believe this will be of use to the Council. I shall make sure they're made aware of its contents. Hmm. I have never heard of this "Shade of the Revenant." Some sort of celestial phenomenon? If that's correct, then Bothiel would be most likely to know something about it, as the caretaker of the Orrery. She should be on University grounds." He then proceeds to remove the text from you inventory. You will then be expected to seek out Bothiel; see here for potential problems when trying to locate her. Raminus will provide you with a brief overview of the Orrery: "A most fascinating contraption. Bothiel is one of the few who understand how it worked, and kept it running." Raminus will advise you to quickly seek out Bothiel for the Council: "Bothiel may know more about this 'Shade of the Revenant' referred to in the book you've given me. Speak with her." After conferring with Bothiel, Raminus will be eager for information: "So, Falcar expressed interest in this Revenant as well, and left this note behind, did he? Perhaps we should look into it for more clues. This lists several locations. The first is 'The Dark Fissure,' which I recognize; it's a cave in the mountains south of Cheydinhal. If there is indeed an altar there, as the note suggests, I believe this cave is directly related to the contents of the book. Go to the Dark Fissure the next time this 'shade' occurs. Search for any connection to what we've learned, and report back. Please, be careful. Anything you find is of no use to us if you do not survive. I believe we are dealing with powerful forces here. Do not put yourself in harm's way, if it can be avoided." He will end the conversation with advice: "Be careful." He will ask you of your progress if spoken to further: "Have you been to the Dark Fissure yet? We need to know all we can about the Necromancers." Once you have visited Dark Fissure (which is conveniently located near the Vahtacen ruins) and told Raminus about the crafting of black soul gems, he will be worried: "So, you saw them? The altars must be infused with some kind of power to change over the soul gems. I shall pass the news on to the Council. Most troubling, indeed, to know that these are not merely myths. I also fear their numbers may be greater than we believed. You have again performed admirably. You have my thanks, and that of the Council as well." As well as Raminus' praise, he will also promote you for your services: "You are Conjurer no more. Guild members shall now address you as Magician. Congratulations." Once you are ready to proceed through the guild Raminus will inform you that you now answer to the Arch-Mage: "Seek out Arch-Mage Traven. He has personally requested that you see him for your next assignment." Apparently a spy for the Council has stopped contacting the guild about necromancer activity. Raminus will tell you that Traven wishes you to take on the assignment. "Your tasks now come directly from Arch-Mage Traven. Please speak with him if you're unsure what you should be doing." Once you have spoken with the Arch-Mage and located the lost Mucianus Alias, Traven will point you to Raminus for further advancement within the guild: "Before we continue, you should speak to Raminus Polus about your advancement within the guild." Raminus will promote you to the rank of Warlock: "Your role within the guild becomes ever more essential. You have now attained the rank of Warlock, and are freely able to access the Council Chamber." Arch-Mage Traven will soon ask for your assistance again. Bruma Chapter Head Jeanne Frasoric has not been in contact, which although a pleasant respite, is unusual behavior. Once you have investigated the Bruma guild hall and found all but J'skar dead and reported back to Traven, he will thank you for your efforts and ask that you speak with Raminus for a promotion. Raminus will praise you for your efforts: "Truly, you are an asset to the guild. I reward you with the rank of Wizard, and teach you a most powerful spell." You will be taught the Wizard's Fury spell, which does multiple types of elemental damage on target. There have been disagreements as of late between Council members as to how to respond to the necromancers' assault upon the guild. The Council has lost its confidence in Traven's ability in protecting the guild, and many fear that the Arcane University will be the next target. Therefore Irlav Jarol and a band of mages have fled to Fort Teleman to study and protect the necromancy artifact called the Bloodworm Helm. Caranya has also taken a group of mages, as well as the artifact known as the Necromancer's Amulet, to the mountain ruin of Fort Ontus where she aims to wield the amulet's power to use against the King of Worms. Things take a bad turn but once both items have been reclaimed, Traven will request you speak with Raminus Polus for a much deserved promotion. Raminus will be more than happy to promote you to the rank of Master-Wizard: "I can truly consider you an equal, and so grant you the rank of Master-Wizard. There is no higher rank which I can bestow upon you. You have my congratulations, and my thanks. After witnessing Traven's heroic sacrifice, you will be tasked with hunting down and killing the King of Worms. When you return to the University after having slain Mannimarco, he will be the first to greet you: "Arch-Mage! You have returned! Mannimarco has been defeated? I can hardly believe it! The King of Worms is no more! I... I received a note from Arch-Mage Traven. I know what he did for us, and that he selected you to take his place. I will mourn for him during my own, private time. For now, I cannot help but rejoice. You have brought safety to the guild, and I thank you. I have already sent word to all the local guild halls that you are now in charge. Congratulations, Arch-Mage." After Raminus has given you his speech you can then talk to him about your privileges, in particular ingredient collecting: "As the Arch-Mage, you are entitled to certain privileges. In addition to the full use of all Guild facilities, there is one service available to you. Julienne Fanis has long served Arch-Mage Traven in collecting alchemical ingredients for his personal research. as the new Arch-Mage, I'm sure she'll extend the service to you as well. At your convenience, consult her at the Lustratorium." This marks the end of the Mages Guild questline. If you ever contract Porphyric Hemophilia and become a vampire and wish to cure yourself of it, there are few who know how. If you speak with Vicente Valtieri of the Dark Brotherhood he will point you towards Raminus for a cure: "A cure? Yes... Yes, I believe it's possible. A mage named Raminus Polus has done some research. He's in the Imperial City, at the Arcane University." If you are not a member of the Dark Brotherhood, any chapel healers can tell you: "A cure? You mean, besides death? Such a thing is beyond our control. The body is so warped by vampirism, few would be able to revert its effects. Even fewer would care to try. The guild of Mages might know more. Speak with Raminus Polus; he may be able to guide you." When you speak with Raminus about the cure he will be happy to help: "I am pleased you would ask. There is a way, though it is not known to me. Count Hassildor has done the most recent research on a cure, I believe. He has what you might call a vested interest in the subject. I suggest you travel there, and seek an audience with him. Given your condition, I believe he may assist you." 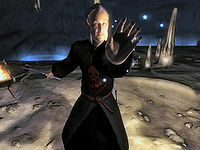 He will continue: "I suggest you petition to see Count Hassildor in Skingrad. He will be interested in your condition." Raminus will play no further role in this quest. 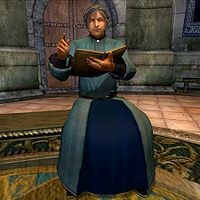 If you have been suspended from the Mages Guild, you will have to speak with Raminus Polus who will be quite disappointed. If it was due to theft he will say: "It is unfortunate that we should meet under these circumstances, Associate. You have been found guilty of theft. As such, your guild privileges have been suspended. If you wish to be reinstated, you must perform a service for the guild. Are you willing to do so?" If you refuse he will be harsh: "If you cannot perform a simple function for the guild, you are clearly undeserving of membership in it." If you want to be reinstated in the guild he will give you the task of restocking alchemy supplies: "Very well. Make no mistake: this task is simple, but has a purpose. In selflessly serving the guild, at risk to yourself, while putting your own feelings aside, you prove your devotion to the cause. You will help replenish alchemical supplies for the guild. Deliver 20 Dragon's Tongue flowers, and 20 Redwort Flowers to me. Surprised? Annoyed? It is not unexpected. Nevertheless, that is your path to re-acceptance in the guild." If you speak to him again he will be eager for your alchemy supplies: "Have you returned with the materials you were sent to collect?" If you attempt to lie he will be aware of it: "You do not have all the materials you were told to collect. Return when you have everything." If you admit you have not yet collected them he will state: "Then we have no further business at this time. Return when you have gathered the supplies." When you have finally collected the items he will forgive you: "Very good. For retrieving these items, your status in the guild will be restored. Know however, that you have only one more such chance available to you. The guild does not take these infractions lightly. Now, you may continue about your business." If you are suspended a second time he will say: "I am very disappointed. I had hoped we would not meet again under these circumstances." If it was for killing a guild member he will say: "You have been suspended from the guild for the death of a guild member. Are you willing to do what is necessary to make amends?" If you say no, he will retort: "Then you shall remain suspended from the guild. If this is your attitude, perhaps we are all better off for it." When you are ready to redeem yourself he will say: "Very well. Bring me 20 Vampire Dust and 20 Daedra Hearts, and your guild privileges shall be restored. I can only hope that putting your life at risk for the guild will put things in perspective for you, and help you to value the privileges it offers." If you speak with him again without the ingredients he will say: "Have you returned with the ingredients you were sent to find?" No? Then I suggest you return to the world and gather them. We have nothing to discuss otherwise." If you try to lie he will be insulted: "Would you even now attempt to trick me? You do not have what I requested. Return only when you have the ingredients. You waste my time otherwise." When you have found the items, he will say: "You have completed your task, and so your privileges in the guild will be restored. Know this: there will be no further leniency. Any more violations, and you will be permanently expelled from the guild." During the Thieves Guild quest Misdirection, the Waterfront District will be raided by the Imperial Legion led by Captain Lex in an attempt to capture Armand Christophe. This causes all business in the Thieves Guild to be shut down. You and other thieves will be needed by the Guild to draw attention away from the Waterfront. The Imperial battlemages that guard the Arcane University will be removed and stationed in the Waterfront. You must then steal an artifact called Hromir's Icestaff from the University and leave a note. Upon discovering the artifact's disappearance, Raminus Polus will immediately send word to Captain Lex in the form of a Dremora to return the battlemages to the University before anything else is stolen. Infuriated at his defeat, Lex has no choice but to relinquish his hold over the Waterfront. He leaves behind a note from Raminus that explains the ordeal. The Guild then request that you return the staff. If you speak with Vicente about the cure for vampirism, it will oddly activate the Darkness Eternal quest. If you are currently suspended from the Mages Guild, Raminus will not speak about the Vampirism Cure until you are reinstated. After the Necromancer's Moon quest be sure to remember to ask Raminus for a promotion, as it is possible to move on to the Liberation or Apprehension? quest without actually being promoted. This is mostly insignificant, apart from costing you an achievement on the Xbox 360. Raminus has a greeting that can normally never be heard due to his Mages Guild dialogue always taking precedence: "Greetings. I am Raminus Polus, Consul for the Mages Guild. Welcome to the Arcane University." This page was last modified on 31 January 2018, at 23:41.